If you'd like to hear more about South India please subscribe to our Monthly South India Buzz (SIB) Newsletter, and get a free ebook. I am a regular reader of South India Buzz. I get inspired by the quotations and the news section is quite useful. The in-depth article gives detailed information and is quite insightful in knowing more about an interesting topic. I eagerly look forward to receiving South India Buzz every month. I look forward for reading South India Buzz, which arrives my mail box monthly. I enjoy the quotations and the recent news of South India. I'm a great fan of the article which the SI Buzz carries each month - a short and valuable article. Read your news letter. Great! Doing good job. Go ahead. Wish you all the best. You can enter your email to receive it monthly and receive your FREE ebook. For your protection we will send you an email to confirm you are really intended to receive it. Once you have confirmed, you will receive the link to download the ebook and you will be subscribed to the South India Buzz newsletter! If you wish to unsubscribe at any time you will find that option at the end of the monthly newsletter. I'll be updating and growing this site with more and more news of South India. PLUS....... if there is any special news during the month will also be informed through this Newsletter. When you fill in the short form above, you will receive a confirmation email. 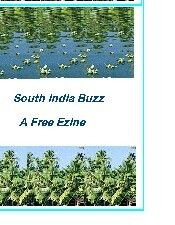 It will ask you if you really want to receive South India Buzz newsletter. This is for your protection and ensures it is really you who submitted your address. Only after you confirm your subscription, will your name be put on the mailing list.